Between 2013 and 2015, the number of Unicorns (private technology companies valued at over $1 billion) exploded from 16 to 140, marking an incredible growth spurt in valuations and positive sentiment toward the venture industry. But after a rocky 2016, in which scandals, funding downrounds, and more cautious investor commentary emerged, many have questioned the validity of the sector’s valuations. With this backdrop, 2017 is shaping up to be a make-or-break year for the Unicorn Club. An analysis of the trends and factors likely to shape the course of the year to come show that bubble-bursting expectations seem unfounded, and that if anything, the prospects for the top privately held tech companies are likely to improve. When Cowboy Ventures’ Aileen Lee coined the term “Unicorn” to describe privately-held startups worth more than $1 billion, she wanted to emphasize the rarity and elusiveness of these finds as a venture investor. It was 2013, the tech sector was awash with investor dollars, Uber and Snapchat had raised large funding rounds at eye-popping valuations, incubators and accelerators were all the rage, and Elon Musk had announced his Hyperloop project. Simply put, things were looking good for the technology sector. What followed in the ensuing years was a remarkable growth in valuations and private-funding for early-stage technology companies. 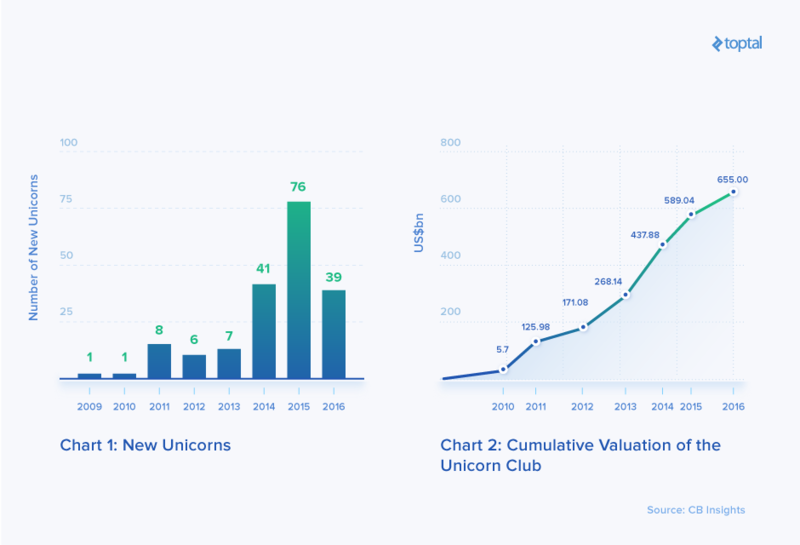 Between 2013 and 2015, the Unicorn Club grew in “membership” nearly nine-fold, and added nearly $400 billion in paper value to the economy (see charts 1 and 2). Aside from Uber and Snapchat mentioned above, other well-known newcomers to the club during that period include Stripe, Slack, Instacart, Lyft, Warby Parker, and 23andMe, amongst others. Unicorns hardly seemed rare anymore, prompting many industry observers to start seriously questioning the sector’s valuations. Despite only representing a small subsection of elite technology startups, the Unicorn Club became synonymous with the entire technology sector’s seeming exuberance. And sure enough, after several frothy years, 2016 marked a different tone and a more challenging environment for the notorious Unicorn Club. First there were the scandals. Theranos, probably the year’s most troubling story, was mired in controversy as the company lost key clients, came under regulatory scrutiny, became embroiled in shocking revelations from former employees, and generally fell from grace. Once worth $9 billion, Theranos seems likely to fall by the wayside soon, perhaps shutting down in the coming months. Another famous Unicorn, Zenefits, was forced to admit that employees had cheated on mandatory compliance practices and that Parker Conrad, co-founder and CEO, had actively promoted practices that allowed Zenefits to get around compliance training to sell insurance in California. Parker Conrad resigned, and in June the company was revalued down from $4.5 billion to $2 billion. The list goes on, with high profile Unicorns such as Lending Club, Hampton Creek, and several others all suffering from scandalous revelations. But whilst scandals might sell papers (or in today’s day and age, online ads), the more serious and troubling point is that these revelations all helped feed the critics. If strong doubts already loomed over the tech sector’s valuations, discoveries of essentially fraudulent behaviour at Unicorn companies only lent further weight to such doubts. And the data seems to back this up. As charts 1 and 2 show, the pace of Unicorn “births” slowed considerably. 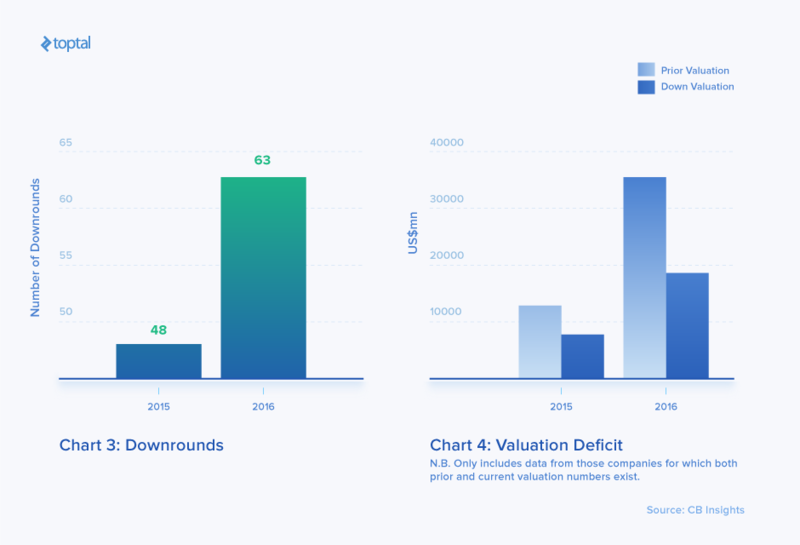 And more troubling, 2016 saw a strong growth in downrounds amongst the Unicorn basket (see charts 3 and 4), a trend which we had already begun to witness since 2015, but that had probably gone slightly unnoticed amongst all the positive news. Suddenly, the Unicorn Club was under stress, and again, by way of its symbolic nature, so was the entire startup and technology sector. The naysayers’ arguments gathered steam, prompting serious questions about whether the strong positive run in the venture space was coming to an end. Looking ahead at 2017, there are encouraging signs for the sector. The same forces that made 2016 a tough year seem to be turning around, and those supporting the run-up in valuations over the last few years don’t seem to have subsided. 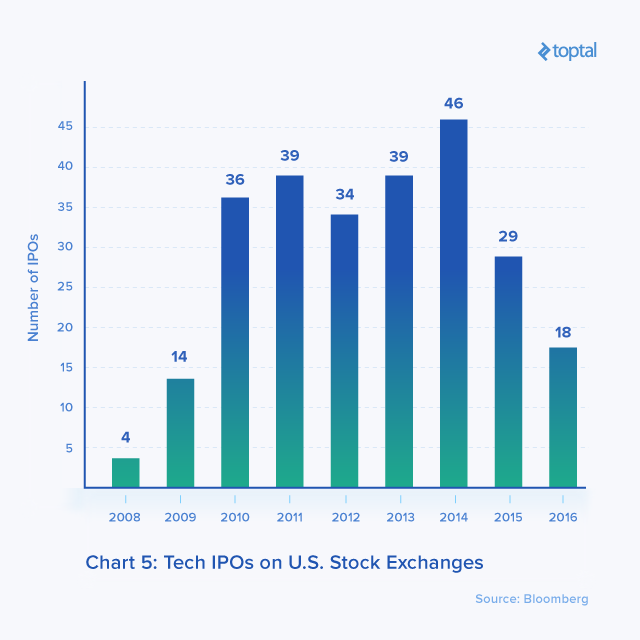 No doubt one of the most surprising features of 2016 was the dearth of IPOs for technology companies. Throughout the first eight months of the year, there had in fact been only one venture-backed technology company that listed on the public markets. And despite a pick up in the last half of the year, 2016 closed as the worst year in terms of number of technology IPOs in the US since the financial crisis (see chart 5). And as far as those that were already public, performance wasn’t encouraging. Twitter, Fitbit, Box, Etsy, amongst others, all legacy 2014-2015 tech listings, saw their stock prices suffer in the public markets, several of them reaching prices of less than half their IPO price. The reasons for this phenomenon are of course varied, but in many ways all tie back to the large amounts of investor capital locked up in private venture funds. Buoyed by growing balance sheets, venture funds poured dollars into technology startups over the prior five to seven years, thus propping up the lofty valuations so many had been decrying. Adding to the above, a large number of investors who previously would have participated in public markets have in recent years been shifting over to private markets in an attempt to chase higher yields, including mutual funds, hedge funds, and sovereign wealth funds. With this context, it is no wonder many companies avoided the public markets. Faced with going public at sharp discounts, and with associated increases in the reporting burden as well as greater transparency requirements for their operations, it seems only normal that a CEO would choose to continue relying on the private markets for liquidity. But there are strong signs that 2017 might be different. Investment bank Union Square Advisors estimates that there might be as many as 90 companies looking to go public over the next year. Morgan Stanley’s top technology banker foresees 30 to 40 technology IPOs this year. The most famous example is of course Snapchat, arguably the most anticipated tech IPO of recent years. Based on its last investment round, Snap, Snapchat’s parent company, is valued at $18 billion. And if the reports out there are to be believed, Snap’s IPO is likely to fetch the company an additional $4 billion at a whopping $25 billion valuation, making it the largest U.S. technology company IPO since Facebook went public in June 2012. Snap’s IPO will be a bellwether listing and will likely set the tone for the year. What’s behind this change of sentiment? Well, no doubt 2016’s “reality check” led to a valuation reset for many technology companies that has helped assuage public market investors’ concerns. Moreover, the more challenging funding environment of 2016 no doubt put pressure on companies to refocus on their metrics and fundamentals in lieu of having to access the public markets in the upcoming future. If 2016 saw a culling of the herd, then we might predict that the remaining companies are the healthier ones. And of course, while a Trump presidency continues to create uncertainty, the short-term effect on stock markets has been largely positive, with a strong rebound in stock prices and a general return of “risk-on” attitude amongst public market investors. All in all, we’ll have to see. But given the lengthening of the IPO queue, it would not be a surprise that if the year starts out positively, perhaps with the Snap IPO performing well, the floodgates may open. Of course, the other important factor to consider is whether the funding environment in the private markets that led to this situation in the first place has even really changed. And it looks like the answer is that it hasn’t. Since 2009, private technology growth investors have continued to raise capital at record rates, up from $11 billion in 2009 to $41 billion in 2015, as noted by Sharespost in their recent report “The Rise of Unicorn Funds”. And much of this continues to remain unspent. According to Preqin, a data aggregation platform for the alternative assets industry, nearly $200 billion in dry powder is available amongst VC investors to put to work. This is likely to continue to support private venture-backed companies. Moreover, most of the capital raised in recent years seems to have gone disproportionately to a more concentrated selection of larger funds. In many ways, the venture investing space has seen a similar “culling of the herd” that the technology companies have themselves experienced. 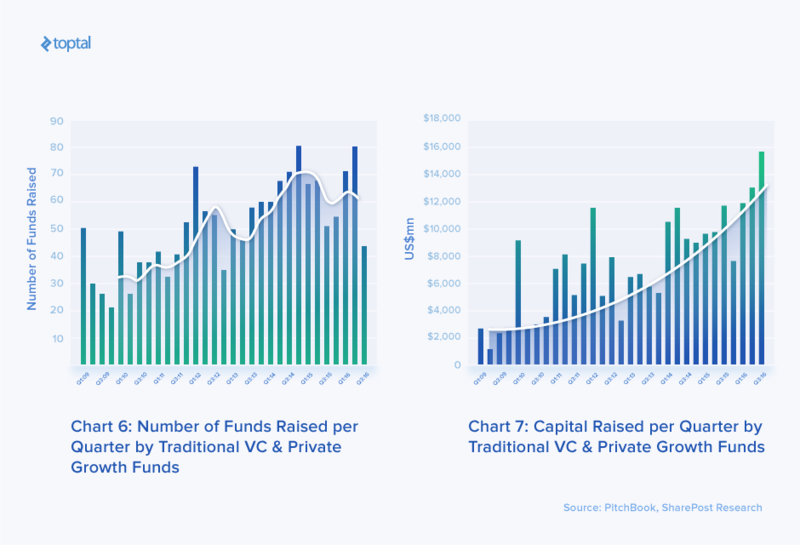 As the charts below indicate, the number of new funds raised seems to have peaked in Q1 2015, whilst the total dollar amount flowing into the venture space continues to grow healthily. If this is true, the future is likely to bode well for the Unicorns. After all, larger funds will need to invest in increasingly larger companies to justify the ticket sizes. And there are not many private technology companies that can soak up that much capital. “Unicorn funds” help sustain Unicorn companies and their respective valuations. Was 2016 Even Really That Bad? Despite all the negative news coming out of the space over the course of last year, we cannot help but think that 2016 was actually not as bad as it might seem. First of all, despite the scandals and cent-on-the-dollar exits (e.g. Gilt Groupe and One Kings Lane), taken as the whole the Unicorn basket continued to perform rather well. Forbes, which famously dismissed bubble concerns at the end of the 2015, revisited their case a year later and found that the basket of “Americorns” (US-based Unicorns) they had been tracking had grown in valuation by seven percent. This was of course heavily influenced by a few outliers, notably Uber, but even excluding these the portfolio was up 2.2 percent. Moreover, despite the scarcity of technology IPOs, those that did go public seemed to have done quite well. Twilio, Cotiviti, Blackline, Line and others are all seeing strong performance in the public markets which is no doubt contributing to the increase in the number of expected IPOs for the year. And for all the downround stories, there were a multitude of fundraising rounds amongst the club of Unicorns that were completed at higher valuations than their previous ones. Amongst these are Snap, Lyft, Slack, and Magic Leap (although the latter is now embroiled in a fresh scandal of its own). To be clear, we are not stating that the skeptics are wrong and that the members of the Unicorn Club deserve their valuations. We are saying that the underlying dynamics that contributed to the growth in the Unicorn Club seem not to have changed much. If anything, they have improved (particularly on the public markets side of the equation). As long as private venture capital and growth funds continue to be awash with capital, we don’t imagine a dramatic bursting of the bubble (if there is one), as many in the industry have been foreseeing. With the above in mind, how should you should position yourself in 2017? This depends heavily on one’s involvement with the sector. For entrepreneurs, our overall assessment is that the picture hasn’t really changed much. Fundraising prospects continue to look good. The principal difference is that whilst 3-4 years ago raising capital was probably almost exclusively a growth story, 2016’s reality check has helped remind everyone in the space that other business fundamentals matter. Make sure to focus on all the underlying fundamentals of your business: profitability (or the path to profitability), unit economics, customer retention, employee satisfaction, etc. But don’t be fooled, growth continues to be the most important metric for venture investors and the one that you’ll need to optimize for in your fundraising efforts. For senior employees at venture-backed companies that are focused on stock-based compensation, the picture is a little bleaker. Private-market funding rounds have in many cases not proven particularly beneficial in this regard since the headline-grabbing valuations have often come at a price. In an effort to avoid downrounds and maintain Unicorn status, new funding often comes with very onerous conditions, for instance liquidation preferences that mean that employee stock-options are likely less valuable than their paper valuations may seem. This is where really doing your homework to try and glean the rights and conditions that investors have in your companies is critical. And be wary of compensation packages overly skewed towards stock. 2016 may indeed have been a cold shower for the Unicorn Club. We learned that when you look under the hood, things aren’t always as rosy as they may seem. And continuing doubts loom over the validity of these companies’ valuations. Nevertheless, despite the hiccups, the forces underlying the huge run-up in Unicorn valuations (namely, liquidity in the private funding market) continue to remain strong. And with IPO markets looking likely to finally start opening up to technology companies in 2017, we only see reasons to be optimistic for Unicorns in the year to come. The music may have quieted down a bit last year, but the party doesn’t seem to be over.